Abstract: Tooth mobility is commonly seen in general dental practice, usually resulting from chronic periodontitis. A fibre-reinforced composite splint may be used to treat mobile teeth successfully. This article will concentrate on the precise steps on how to place such a periodontal splint. Minimally invasive options should always be considered. In long-term maintenance of periodontally involved teeth where the active disease is under control, the periodontal splint can be very helpful as part of a comprehensive periodontal treatment plan. Clinical relevance: A fibre-reinforced composite periodontal splint may improve the masticatory ability and consequently the patient’s quality of life. 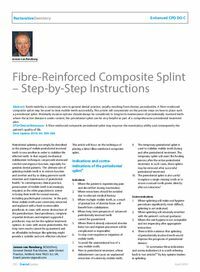 Objective: To provide step-by-step guidance on placing fibre-reinforced composite splints.